Congress passed the Clean Water Act in 1972, but it was slowly amended and refined. By 2000, the Army Corps of Engineers and the Environmental Protection Agency had settled on clear definitions of what constitutes “waters of the United States”. Not everyone, however, agreed with them. 15 February 2018 | In 1969, Ohio’s oil-laden Cuyahoga River burst into flames. Many of us who were children then remember it like it was yesterday. A river – a flowing body of water – caught fire??? A flowing body of the stuff we spray on fire to kill it… became fire? What our half-formed brains (and many fully-formed ones) didn’t realize is that this was neither the first nor the worst time the Cuyahoga had burst into flames. It was the 13th conflagration in 100 years, and earlier episodes had killed people or raged for days, decimating miles of riverfront property and costing millions of dollars in damage. But this was the the late 1960s, and people were sick of it: sick of burning rivers, sick of dead lakes… sick of being sick. By the end of the year, Congress had passed the National Environmental Policy Act, which led to the creation of the Environmental Protection Agency. By 1972, they had completely rewritten the Federal Water Pollution Control Act, creating what came to be known as the Clean Water Act (CWA) – the first federal protection for those surface waters that fell under federal jurisdiction. Lawmakers drafting the bill were careful not to define the terms further “based on the fear that any interpretation would be read narrowly,” according to the report that the House of Representatives sent along with the bill it sent to the Senate. 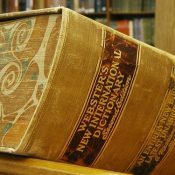 Rather than change the words they used, lawmakers changed the usage of the words, and they gave the implementing agencies leeway to do the same, within the bounds of reason and science. “The [Public Works] Committee fully intends that the term ‘navigable waters’ be given the broadest possible constitutional interpretation unencumbered by agency determinations which have been made or may be made for administrative purposes,” the House report said – and with good reason, according to both University of Colorado Biologist William Lewis and legal scholar William Sapp, writing in “Wetlands Explained” and “From the Fields of Runnymede to the Waters of the United States”, respectively. Both of them chronicle the debates lawmakers undertook while grappling with the challenge of protecting something that not only flows from US state to US state, but from physical state to physical state – from ice to liquid to vapor – as surface waters (as opposed to groundwater, which is protected differently) move over ground and through earth and air. In those less partisan days, a Senator like Ed Muskie of Maine was able to cite the latest research on “hydrologic cycles” without some James Inhofe-type character popping up with a snowball or water-bottle to “refute” him. The overwhelming majority of lawmakers agreed to give the Army Corps and EPA room to administer the law as they saw fit, on the premise that these administering agencies held the expertise, and that courts would act as a backstop for any overreach. The Supreme Court would eventually rule that even courts should defer to administrative expertise, unless the agencies fail to explain their actions in a reasonable way or run afoul of something called the Administrative Procedures Act, which lays out procedures for creating and implementing rules like this. Although often credited with delivering the Clean Water Act, President Richard Nixon derided it as “budget-wrecking” and vetoed it. Both houses of Congress overrode the veto by wide margins, and with broad bipartisan support. Wetlands – In or Out? The new law didn’t ban pollution, dredging, or filling, but Section 404 did require real estate developers or anyone contemplating projects that impact “navigable waters” to first get permission from either the Army Corps of Engineers or a state or tribal agency acting on its behalf before breaking ground or dumping into the waters. The Army Corps created a clear but cumbersome process for issuing permits, but wetlands were a point of contention from day one – and not because ravenous regulators were hungering to expand their turf. The Corps initially balked at being required to inspect and approve territory beyond its traditional purview of rivers, streams, and coastal areas – let alone so much of it – but the Natural Resources Defense Council sued, and the US District Court of Connecticut ruled that, in the context of the CWA, the term “navigable waters” was clearly “not limited to the traditional tests of navigability” as defined in the dictionary. Under the Clean Water Act, the Army Corps of Engineers must regulate “waters of the United States”. Sometimes, as in this Army Corps illustration, those waters are easy to delineate. But not always. By 1977, wetlands were solidly in the law, and with bipartisan agreement. In 1987, the EPA convened a group called the National Wetlands Policy Forum. The concept of no net loss dovetailed with the permitting provisions in Section 404 of the Clean Water Act, where Congress tried to strike a balance between economy and ecology. They acknowledged that cities would expand and contract, and there might be a time when it’s in most people’s interest to let a city build a road through a wetland, or let a developer dredge a stream for a new housing project, or even discharge pollutants into a river. In such circumstances, if local authorities green-light a project, it still has to ask the Army Corps of Engineers for permission to impact the waters of the United States, and that’s when the permitting process begins. The process involves mandatory public consultation and is built on a “mitigation hierarchy” that also applies under the Endangered Species Act, where the Department of Fish and Wildlife oversees permitting for projects that impact sensitive habitat. Researchers recently reviewed 88,000 consultations under the ESA between 2008 and 2015 and found that no projects had been stopped or even changed in a major way to protect habitat, and earlier regional studies of wetland permitting show that 95 percent of all requests are granted. The hierarchy says developers should first try to avoid damages, then minimize those they can’t avoid, and finally fix any areas they damage or restore similar areas of equal or greater value in the same watershed. The process was slow at first, as developers were forced to fix their own messes or restore degraded areas directly, but it sped up as entrepreneurial ecologists and landscape architects began proactively restoring degraded areas to create offsets for sale to developers, as we’ll see in part four of this series. 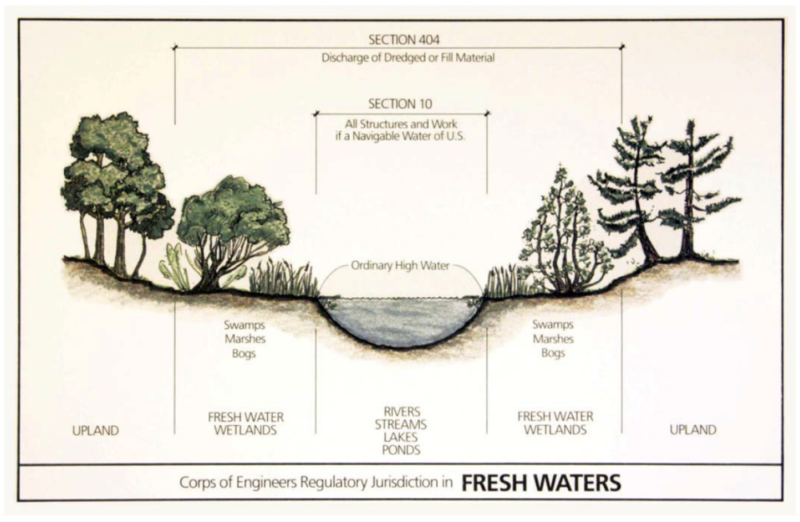 In actual fact, the Army Corps created a detailed manual for identifying wetlands in 1987, and it built the guidance on the hydrologic properties associated with lands that filter water, regulate floods, and provide habitat. But long-term hydrologic records aren’t available for most lands, so the Corps turned to indicators. Some landowners, he says, would try to disguise the land by removing the vegetation, but the soils remained, and the land – though dry on the surface – was usually too waterlogged to support agriculture. It was broad, but the underlying theme was some sort of connection to waters that were navigable in the dictionary sense. The Army Corps even extended the definition to isolated or man-made ponds that served as habitat for migratory birds – a definition that proved controversial from day one. In 1988, Michigan real estate investor John Rapanos optioned 175 acres of land in Williams Township to a developer who wanted to build a shopping mall. Rapanos began clearing the land, and his lawyer filed the requisite paperwork with the Michigan Department of Natural Resources (DNR) on December 2. By all accounts, he made good on his threat, and DNR inspector Charles Dodgers documented what he called “systematic wetlands destruction” over the coming months. The state issued the first of several cease-and-desist orders in July, but Rapanos’s attorneys argued that the federal law did not apply to him. So the state called in the federal EPA, which issued its own cease-and-desist order in 1991. Rather than heed the warnings, Rapanos began clearing and filling two other wetlands that clearly drained into far-away rivers and streams – spending $158,000 to destroy 17 of 64 acres of wetland on one 275-acre property, and spending $463,000 to destroy 15 of 49 acres on a 200-acre site. What’s more, all of the properties had surface connections to tributaries of “traditionally navigable” waters (also called “navigable-in-fact” waters), which are those you can sail a boat on. Specifically, one connected to a drain that flowed into a creek that flowed into the Kawkawlin River. Another connected to a drain that flowed into the Tittabawassee River. And the third flowed directly into the Pine River, which flows into Lake Huron. Rapanos appealed – based primarily on his belief that the federal government had no jurisdiction on his land. The case spent years bouncing around the courts before being picked up pro bono by the Pacific Legal Foundation (PLF), a libertarian law firm devoted to fighting what it perceives as federal overreach. PLF attorney Reed Hopper dismissed the wetlands as “puddles”, but he primarily argued that they were too far away from “navigable-in-fact” waters to be considered “navigable waters”, and were thus not part of the waters of the United States. Rapanos wasn’t the only person who believed the Army Corps had pushed the envelope on its definition of what constituted navigable waters. In 1992, three years after his battle began, the Corps denied the Solid Waste Agency of Northern Cook County (SWANCC) permission to convert old quarries into waste dumps, arguing that the quarries had become isolated ponds akin to the naturally-occurring prairie potholes that dot the Great Plains and provide habitat for migratory birds. The old quarries’ new function as habitat, the Corps said, brought them under their protectorate. That sparked a nine-year court battle that landed in the Supreme Court in 2001, resulting in a 5-4 ruling that the Army Corps’s “Migratory Bird Rule” was a step too far, and that even prairie potholes were outside its purview. Migratory birds, they said, didn’t provide a “significant nexus” between isolated ponds and waters that were “navigable in fact”. Those ponds were, therefore, not “navigable” even under the evolving definition, and were therefore not part of the waters of the United States. Meanwhile, John Rapanos’s court battle with US regulators was working its way up the system, and it reached the Supreme Court in 2006.